Whilst in Ireland, after reading some of my posts about my classical music investigations I was asked if I was beginning to recover some of my enjoyment of melody in music. Possibly this is the case, but I’d be more inclined right now to say that I am merely enjoying the passion that emanates from a strong, emotional performance of intelligent music, and for the first time in a few years I have opened my ears to really spend time with other musical genres than that which I devote most time to. Its also very noticeable that as I’ve been able to spend a little time this year with knowledgeable people that I respect (something that is pretty hard to do generally here in deepest South Oxfordshire) then their recommendations will rub off on me. My recent investigations of Shostakovich for example comes directly from a Keith Rowe recommendation, and spending time with Paul in Dublin last week has only lengthened my list of music to try and check out. This leads to Tommy Potts. I think I first heard Potts’ album The Liffey Banks back in February when I went over to Dublin for The Sealed Knot gig. I know that in March this year I certainly heard it, in the same place, playing on David Lacey’s stereo late at night after one or more of the i and e Festival shows. A large whiskey undoubtably helped my mood, but this music, this sole forlorn fiddle, played quietly in the room as we relaxed exhausted. I was captivated at the time by this album, and another by the Art Ensemble of Chicago that we listened to that night. Subsequently I found the AEC disc, A Jackson in your house / Message to our folks, bought it and have enjoyed it, though not as much as I did that evening in good company fuelled by the latter stages of a bottle of 10 year Jamesons. The Tommy Potts record though I didn’t look for. Not because I didn’t ike it, but because I thought it was a long out of print release, as David played it on old well worn vinyl. Unbeknown to anyone other than myself the record had preyed on my mind somewhat since then, and particularly recently as I have been enjoying such powerful, emotional music away from my usual musical comfort zones. When I left for Dublin last week I made a decision to get David to record me a copy of the album if after playing it I liked it as much, but when I mentioned this, to my great pleasure he informed me it was in print as a CD and available from Claddagh Records, a local traditional music shop that also put out the release. So after another great evening slumped on David’s sofa whiskey in hand and Potts lighting the room up in his own gentle fashion I went the next morning to Claddagh, a nice little shop staffed by a somewhat miserable gentleman, but I am pleased to say I came home from Dublin with a copy. So what’s all the fuss about, and does it still sound as good played here in suburban Home Counties England? 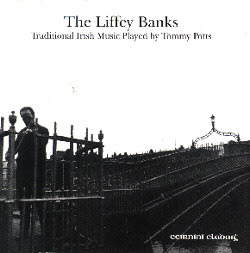 Well to answer the second question yes it does… The Liffey banks is basically a 42 minute disc featuring 22 recordings of Potts performing his solo renditions of traditional Irish music. What lifts this disc so high for me is the deeply emotional playing, with Potts presenting his own take on the music, at once both raw, gritty performances and heartfelt sorrowful playing. This is basically one man and his simple instrument playing simple songs, yet there is such passion and feeling pouring from my speakers right now as the disc spins for the umpteenth time this week. I find The Liffey Banks best late in the evening, or right now at 2AM after a bottle of wine, played quietly, allowing the music to seep up from the corners of the room and get under your skin rather than blasting it loud. Maybe this sounds like drunken nonsense from someone that can attain equal levels of enjoyment from the more ascetic corners of music’s avant garde but its an honest response to what I think is a great piece of music. It doesn’t surprise me to learn that Potts caused a considerable stir in the Irish music communities because his unorthodox, semi-improvised performances of the music broke the unwritten rules of the music. I hear on this CD a deeply honest and inspired musical voice. The sleeve notes tell a tale of how Potts (who died in 1988 at the age of 76) would regularly come home in the evening to his Dublin house, and play alone in his sitting room until his tears kept him from going on. Need I say more? You’re touching a part of me I usually keep submerged. The fiddle traditions of my ancestors ( Irish/Norwegian ) always release whatever neurotransmitter to whatever synapses. I always try and deny it, but I always fail. I’ll have to check out Potts. Yeah I am not usually a big fan of any kind of folk music, but the Potts album is something special and really touched me. I’d recommend seeking it out, it actually looks pretty easy to order online. Shame I didn’t even think of looking months back! Doug, should I know who you are? From Irish fiddling to Rappin’Duke. What a strange world we live in….